Princess Nora Bint AbdulRahman University in Riyadh recently enhanced it's billion dollar surveillance system by adding 150 pairs of OT Systems' ET1111 media converters to it's state-of-the-art access control system spanning the entire campus. This is the University's second phase of OTS product installations. It first installed OTS solutions nearly four years ago as part of their video surveillance and perimeter-intrusion detection systems. Princess Noura Bint AbdulRahman University, the kingdom's flagship security project featuring OT Systems' industrial Ethernet media converter, is the first women's university in Saudi Arabia as well as the largest women-only university in the world. In the campus, patrol patterns require more areas to be monitored by CCTV and access control systems when security guards are not present. 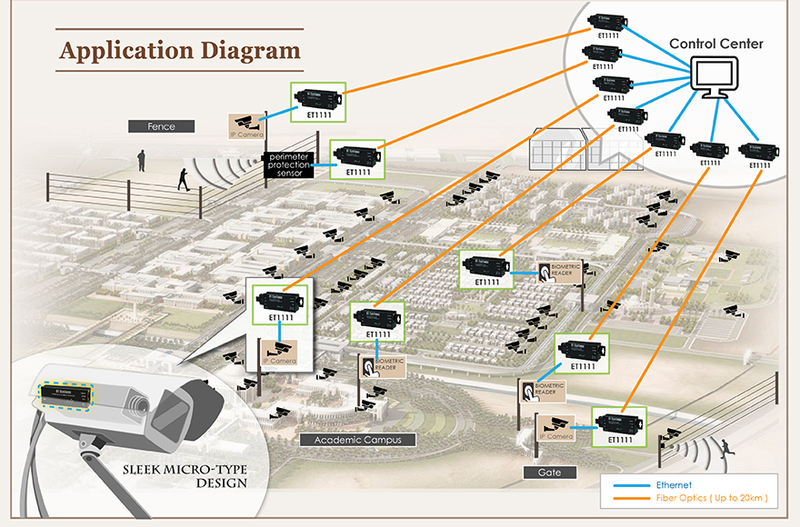 The system utilizes a number of IP cameras installed along the fence and inside university buildings for perimeter protection and surveillance. Leveraging 986 pairs of OT Systems ET1111 (Industrial grade 10/100Base-TX + 100Base-FX media converter), each converter is dedicated to one IP camera or device. OT Systems guarantees the safety and stability of data transfer throughout the site using the point-to-point media converting solution. Only one camera will be affected if a converter is in trouble. Thanks to its extremely compact size design, the media converter is small enough to fit inside the IP camera housing. Its 24VAC power compatibility also shares a power source with the camera. Designed for outdoor installation, the ET1111 withstands operating temperature from -10℃ to 60℃. OT Systems’ media converters offer customers a reliable and stable device for connecting IP devices with fiber links, providing an excellent transmission solution for the university access control system. It offers the flexibility of connecting the biometric readers at each access control location and the central server with a variety of fiber links (single-mode/multi-mode, 1/2 core), extending the transmission distance up to 20km. As security projects continue to increase in scale and complexity, system integrators face the issue of enhancing efficiency over longer distances. OT Systems’ Ethernet media converter plays a key role in promoting a safe learning and working environment for its users. OT Systems, a company dedicated to transmission solutions, specializes in the design and manufacturing of high-quality, value-based transmission devices. The company's in-house research and development team focuses on creating innovative products designed to meet the changing demands of the growing security market. Our broad product spectrum span a variety of transmission requirements from HD-SDI, Ethernet, video, audio, data and contact closure signals transmission over fiber optics. All products are quality assured and are manufactured in the OT Systems' ISO 9001 certified facility. OT Systems' products meet a variety of application requirements and offer transmission flexibility. They are particularly suited for security and transportation surveillance, such as airport, warehouse, railway, highway/toll station control, perimeter protection, manufacturing facilities, institutions and all other areas where video and data transmission quality is a top priority. For further information about OT Systems, please visit our website at www.ot-systems.com.